Social learning is how groups work and share knowledge to become better practitioners. Organizations should focus on enabling practitioners to produce results by supporting learning through social networks. The rest is just window dressing. Over a century ago, Charles Darwin helped us understand the importance of adaptation and the concept that those who survive are the ones who most accurately perceive their environment and successfully adapt to it. Cooperating in networks can increase our ability to perceive what is happening. Jon Husband’s working definition of Wirearchy is “a dynamic two-way flow of power and authority, based on knowledge, trust, credibility and a focus on results, enabled by interconnected people and technology”. We are seeing increasing examples of this on the edges of the modern enterprise. WorldBlu.com’s annual listing of our most democratic workplaces continues to grow and gain attention. Google’s dedicated time-off for private projects, given to its engineers, promotes non-directed learning and collaboration. Zapposdirectly engages with its customers on Twitter, fostering higher levels of two-way trust. As customers, suppliers and competitors become more networked, being more wirearchical will be a business imperative. Wirearchies inherently require trust, and trusted relationships are powerful allies in getting things done in organizations. Trust is also an essential component of social learning. Just because we have the technical networks does not mean that learning will automatically happen. Communications without trust are just noise, not accepted and never internalized by the recipients. Think and act at a macro level (what to do) and leave the micro (how to do it) to each worker or team. The little stuff is changing too fast. Engage with Web media and understand how they work. The Web is too important to be left to the information technology department, communications staff or outside vendors. Use social media to make work easier or more effective. Use them to solve problems for work teams and groups. Make traditional management obsolete. Teach people how to fish or better yet, teach them how to learn to fish themselves. If the organization is maintaining a steady state then it has failed to evolve with the environment. Most 20th century workplaces had two types of learning: formal learning through training and informal learning (about 80% according to available research) which just happened by accident or the result of observation, conversation and time in the job. This focus on formal training, for skills and knowledge, missed out on our social nature. Business has always been social, especially at the higher levels of management and with ubiquitous access to networks, this is once again part of everyone’s work. In the global village, we are all interconnected. Jane Hart, social learning consultant, has shown how social media can be used for workplace learning and that instead of just training, there are five types of learning that should be supported by the organization. Notice that traditional training (FSL) is only one of the five types. 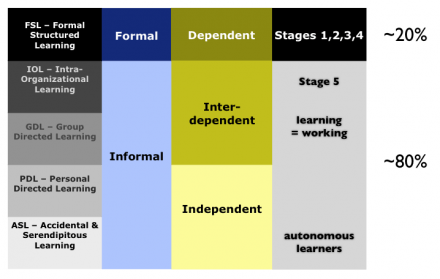 Three of these (IOL, GDL, PDF) require self-direction, and that is the essence of social learning: becoming self-directed learners and workers, all within a two-way flow of power and authority. 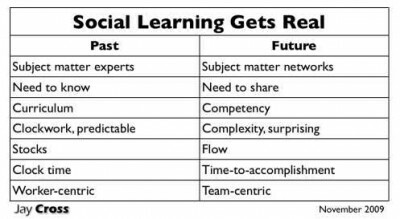 Social and informal learning are not just feel-good notions, but have a real impact on an increasingly intangible business environment. 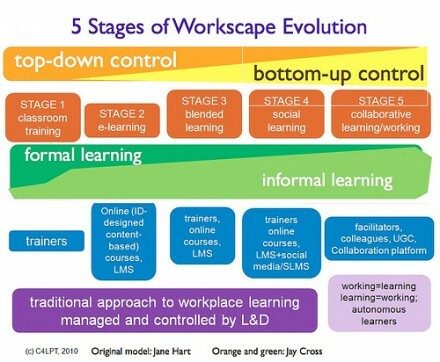 The changes in becoming a networked workplace can be further analyzed using Jane Hart’s five ways of using social media for learning in the organization. Learning is conversation and online conversations are an essential component of online learning. Online communication can be divided into Stocks (information that is archived and organized for reference and retrieval) and Flows (timely and engaging conversations between people, including voice or written communications). Blogs allow flow and micro-blogs, like Twitter, enable great flow due to the constraint of 140 characters. The web enables connections, or constant flow, as well as instant access to information, or infinite stock. Stock on the Internet is everywhere and the challenge is to make sense of it through flows of conversation. It is no longer enough to have the book, manual or information, but one must be able to use it in changing contexts. Because of this connectivity, the Web is an environment more suited to just-in-time learning than the outdated course model. ASL is shifting from looking at knowledge as the collection of bits and engaging in the learning flows around us, without any conscious plan. We are working and learning in networks and the only thing a network can do is share. Complexity, or maybe our appreciation of it, has rendered the world unpredictable, so the orientation of learning is shifting from past (efficiency, best practice) to future (creative response, innovation). Organizing our own learning is necessary for creative work. Workplace learning is morphing from blocks of training followed by working to a merger of work and learning: they are becoming the same thing. Change is continuous, so learning must be continuous. Developing emergent practices, a necessity when there are no best practices in our changing work environments, requires constant personal directed learning. In complex environments it no longer works to sit back and see what will happen. By the time we realize what’s happening, it will be too late to take action. Accepting surprise is similar to the delight an artist may have on completion of a work and only then see an emergent quality not consciously understood during the process of its creation. As mentioned earlier, the real work in organizations is done by groups. This means that sending individuals on a training course and then re-integrating to their work group is relatively useless. With work and learning merging in the network, groups need to find ways that support each member’s learning, while engaged in tasks and projects. Tools that can capture activities and keep group members focused should be used to reinforce group learning. Social learning requires a certain amount of effort to maintain regular contact and association with our colleagues. Developing social learning practices, like keeping a work journal, may be an effort at first but later it’s just part of the work process. Bloggers have learned how powerful a learning medium they have only after blogging for an extended period. With the increased use of distributed work groups, it is even more important to foster social learning and web media are the current tools at hand. Mark Oehlert, anthropologist, historian and technologist, recently coined the term Subject Matter Networks as a new way of finding organizational knowledge. Instead of looking for subject matter experts from which to design training, we should extend knowledge gathering to the entire network of subject-matter expertise. Once again, the emphasis is no longer on the individual node but on the network. Good networks make for effective organizations. Networked communities are better structures in dealing with complexity, when emerging practices need to be continuously developed and loose ties can help facilitate fast feedback loops without hierarchical intervention. Collaborative groups are better at making decisions and getting things done. The constraints of the group help to achieve defined goals. Simple work will be automated. Complicated work will go to the lowest bidder, as processes & procedures become more defined and job aids more powerful (e.g. mortgage applications). Complex work requires creativity and is where the value of the post-industrial organization lies. Dealing with Chaos sometimes has be confronted and this requires creativity as well as a sense of adventure to try novel approaches. There remains a need for training in the networked workplace but it must move away from a content delivery approach. The content will be out of date before the training is “delivered” (another outdated term). Work competencies will still need to be developed through practice and appropriate feedback (what training does well) but that practice will have to be directly relevant to the individual or group (group training is an area of immense potential growth). Jointly defining work competence with input from individuals, groups and subject matter networks should become the new analysis process, enabled by social media. Think of it as social ADDIE (analysis, design, development, implementation, evaluation) for the complex workplace. Our workplaces are becoming interconnected because technology has enabled communication networks on a worldwide scale. This means that systemic changes are sensed almost immediately. Reaction times and feedback loops have to get faster and more effective. We need to know who to ask for advice right now but that requires a level of trust and trusted relationships take time to nurture. Our default action is to turn to our friends and trusted colleagues; those people with whom we’ve shared experiences. Therefore, we need to share more of our work experiences in order to grow those trusted networks. This is social learning and it is critical for networked organizational effectiveness. Our current models for managing people, training and knowledge-sharing are insufficient for a workplace that demands emergent practices just to keep up. Formal training has only ever addressed 20% of workplace learning and this was acceptable when the work environment was merely complicated. Knowledge workers today need to connect with others to co-solve problems. Sharing tacit knowledge through conversations is an essential component of knowledge work. Social media enable adaptation, and the development of emergent practices, through conversations. Most companies start simple, with a few people gathering together around an idea. For small companies, decision-making, task assignments and direct interaction with clients are rather straightforward. With growth, the simplicity ends. As every entrepreneur knows, the initial growth of a company is often synonymous with efficiency drops and decreases in profits, since administrative tasks, indirect structural costs and middle-term forecasts add financial and human pressure on early growth. Overcoming these obstacles is one of the main burdens of start-ups and young businesses. Innovation abounds in the early stages and knowledge capitalization is aided by a common vision of the business. Further growth equates to sustainable efficiencies and market share increases. For decades, organizational growth has been viewed as a positive development, but it has come at a cost. As organizations grow, the original simplicity gets harder to maintain. Current management wisdom – based on Robin Dunbar’s research; the size of military units through history; and the work of management experts such as Tom Peters – considers the ideal size of an organization to be around 150 people. Beyond this size, knowing everybody in person becomes impossible. Intermediate layers of power and delegation begin to develop above 150 people and companies then enter the realm of complication. Most of today’s larger companies have a complicated structure. To enable growth and efficiencies, more processes are put in place. This is what management schools have been doing for over half a century. To ensure reliable operations and risk mitigation, the core competencies of decision-making and innovation are moved to the periphery. The company’s vision, if there is one, is now supported at the board level but not the individual level. New layers of control and supervision continue to appear, silos are created, and knowledge acquisition is formalized in an attempt to gain efficiency through specialization. As companies get even bigger, internal growth and innovation reach a tipping point, and companies rely on mergers and acquisitions to maintain the illusion of growth. At some stage of complication, companies do not even create jobs anymore. In France, a study (PDF) from INSEE showed that large organizations have a tendency to destroy internal jobs: by transferring jobs to subsidiaries, contractors and subcontractors. Large firms barely participate in job creation. Similar studies conducted in other countries show the same results. However, knowledge, and the acquisition of new knowledge, are still key factors for innovation and effectiveness. To compensate for its complicated processes, the enterprise attempts to shift to another paradigm, and tries to become a learning organization, putting significant effort into training. Today’s large, complicated organizations are now facing increasingly complex business environments that require agility in simultaneously learning and working. Typical strategies of optimizing existing business processes or cost reductions only marginally influence the organization’s effectiveness. Faster evolving markets challenge the organization’s ability to react to customer demand. Decision-making becomes paralyzed by process-based operations and chains of command and control; thereby decreasing agility. Training, as “the” solution to workplace learning needs, fails to deliver and then gets marginalized, often being the first department to have its budget cut. Many organizations today are also facing significant demographic challenges. Baby boomers, once the lifeblood of business, are retiring, while Generation Y wants to communicate and interact in a completely different manner. There may be four generations in the modern workplace and each has its unique traits and demands. There is growing complexity both inside and outside the organization. Organizations need to understand complexity, instead of simply increasing complication. This lack of understanding, as well as some existing, but minor, efficiency improvements in tweaking the old system, are the major barriers to adopting Enterprise 2.0 concepts and practices. Companies need to get a clearer view of the competitive advantages of Enterprise 2.0 before an organizational framework like wirearchy can co-exist with hierarchical structures and thinking. However, social knowledge acquisition in the organization is a different case. It requires a very different approach. First of all, centralized control won’t work. Secondly, individuals will become responsible for their learning and their actions. This requires trust. Control systems become counter-productive. There is no easy way to move an organization into this wirearchical space. It requires some serious thinking about how things get done. It means giving up control. It means organizational life in perpetual Beta, and that can be a scary thought. Let’s look at how social learning can support emergent practices in the enterprise. Knowledge workers get things done by conversing with peers, customers and partners, as they solve the problems of the day. Learning from these social interactions is a key to business innovation. In a globally networked economy, based increasingly on intangible goods and services, constant innovation is necessary to stand out. Markets such as software, financial services, consulting and consumer goods have to continuously adapt their offers to keep up with changing demands and advances in technology. Hyper-linked knowledge flows have made organizational walls permeable. Official channels are competing with an expanding number of informal communications. A collaborative enterprise is becoming the optimal organization for such a networked economy, capitalizing on these expanding knowledge flows. To innovate, organizations need to collaborate internally and this is social. To participate in their markets, organizations, customers and suppliers need to understand each other and this too, is social. Social learning is how knowledge is created, internalized and shared. It is how knowledge work gets done. In complex environments, learning is much more than just a matter of structured knowledge acquisition. However, that is all that training enables. Corporate training methods often consist of delivering content and perhaps providing drill and practice sometime prior to doing the task. There is often a gap between training and doing. Training alone cannot address the wide variety of informal learning needs of workers. Nor can it help to transfer the tacit knowledge on which many of us depend to do our jobs. We know that informal learning happens all of the time but often the best answers or experts are not connected to the person with the problem. Social learning networks can address that issue by giving each worker a much larger group of people to help get work done. Regularly publishing to our networks is how we can stay connected. Here is an approach to embed social learning into organization work flows. This is an iterative process that can be adapted to fit the context. Listen & Create: Being open to self-education is the foundation of individual learning. Part of this is the development of habits of continuous sense-making by recording what we hear, read and observe; e.g. personal learning environments (PLE) & personal knowledge management (PKM). Converse: Sharing is an act of learning and can be considered an individual’s responsibility for the greater social learning contract. Without sharing, there is no social learning. Through ongoing trusted conversations we can share tacit knowledge, even across organizational boundaries; e.g. social learning. Co-create: Group performance enables the creation of new knowledge and is a source of innovation; e.g. collaborative work, customer experience. Formalize & Share: Some informal knowledge can be made explicit and consolidated through the formalization and creation of new structured knowledge; e.g. taxonomies, document management, storytelling. Jane Hart has created a comprehensive, and growing, list of social learning examples in the workplace. Companies listed here include British Telecom, Sun Microsystems, NASA, Nationwide Insurance, and SFR. The SFR case study, reported by Sue Weakes, shows how a younger workforce is demanding better access to social media. French mobile phone company SFR implemented ActiveNetworker from Jobpartners to support its new social network. My SFR comprises a company blog, a central space for discussion, and the ability to build profiles that allow employees to share information on career progress, learning and development and aspirations. They can also join groups of interest … ActiveNetworker has been well received and SFR is averaging 80,000 visits per week from the 10,000 employees that are using it. Dave Wilkins at Learn.com, describes the case at ACE Hardware in which the company set up a web-based social learning platform for its 4,600 independent hardware dealers to share and seek advice. They were able to look for new sales leads, find rarely used items through the community and share merchandising display strategies. This social learning community strategy resulted in a 500% return on investment in just six months. I try to see a client every day, and because of my title I get to see more senior people. And so then they’ll tell me things — you know, what are their biggest problems, what are their biggest issues, what are their biggest bets. All this information is incredibly valuable. Now, what could I do with that? I’m not going to send that out in a broadcast voice mail to everyemployee. I’m not even going to write a long e-mail about it to every employee, because even that is almost too formal. But I can write five lines on Yammer, which is about all it takes. The Ford Motor Company has used social media for learning, beginning with SyncMyRide, and now integrating it as a way to connect customers and the company. Ford’s intention is to consider how social media can inform the company as a whole, rather than judging its efforts by the criteria of one department and those “holistic” lessons filter up and down through the company, says Monty [head of social media]y. That includes the company’s executive board and goes as far as putting up senior execs for online Q&As through Twitter and on the corporate Facebook page. “There is a healthy respect for [social media] and how we participate in it. Two-way dialogue is healthy for a company like Ford, and we’ve grown as a result of having participated in it,” says Farley [Chief Communications Officer]. At some point, as executives grow in seniority, they tend to become “isolated from reality,” adds Monty. Making the Ford board aware of and engaged with social conversations counters that isolation. “When [CEO Alan Mulally] says we are making the cars people want, well, how do we know unless we are listening?” asks Monty. Knowledge flows – which occur in any social, fluid environment where learning and collaboration can take place – are quickly becoming one of the most crucial sources of value creation. Facebook, Twitter, LinkedIn, and other social media foster them, as do virtual communities and online discussion forums and companies situated near one another, working on similar problems. You guessed it: new media is largely free. So why teach it in school as if it were a scary theory? Why encourage people to be afraid? Just do it. Build your own platform. Appear in the places that seem productive or interesting or challenging or fun. Experiment quietly, figure out what works, do it more. No need to be a dilettante, and certainly you shouldn’t spread yourself too thin or quit at the first sign of failure… but… quit waiting for the right answer. Our social networks have a greater influence on us than we think. Nicholas Christakis & James Fowler explain the latest research in great detail in the book, Connected: The surprising power of our social networks and how they shape our lives. Robin Hanson, of OvercomingBias.com, shows that we seldom change our behaviour based solely on getting new information. “People don’t believe something works until they’ve seen it work in something pretty close to their situation. A media story about something far away just doesn’t say much.” Again, social learning is about getting things done in networks. engage in focused conversations – increasing their understanding of the available resources. Listen: The first step in social learning is paying attention and watching what others are doing. Finding trusted sources of information is very important. Hearing what others are doing and connecting to them with social media such as Twitter or blogs increases the chances of accidental and serendipitous learning. For example, one can follow conversations on Twitter by searching for “hashtags”. Typing “#PKM” may show current conversations on personal knowledge management. Converse: By engaging in conversations and providing valuable information to others one becomes part of professional networks. Many experts are willing to help those new to the field but newcomers first must say what they don’t know. Co-create: Over time one can engage more in co-operative activities, such as adding comments to a blog post or extending the thought in an article or discussion thread. For many people used to traditional work, working transparently in the open takes some time to get to used to. Formalize & Share: Writing professional journals or lessons learnt can ingrain the important process of formalizing aspects of social learning. Sharing with others, internally or externally, over time becomes part of a normal daily work flow. As our work environments become more complex due to the speed of information transmission via ubiquitous networks, we need to adopt more flexible and less mechanistic processes to get work done. Workers have many more connections, to information and people, than ever before. But the ability to deal with complexity lies in our minds, not our artificial organizational structures. In order to free our minds for complex work, we need to simplify our organizational structures. This is the next evolution of social enterprise.